AAPA projects seaports will require $66 billion in infrastructure investments over the next decade. AAPA: US needs $34 billion for dredging and $32 billion for port road and rail connectors. AAPA port infrastructure plan requires no additional tax burden on transportation industry or taxpayers. US tariffs and responses from trading partners impact 9 percent of US trade and 14 percent of containerized trade. 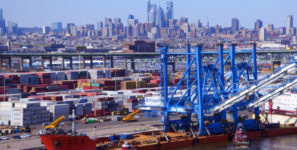 In a hearing today before the US Senate Finance Committee’s Subcommittee on International Trade, Customs and Global Competitiveness, the American Association of Port Authorities (AAPA) testified regarding the infrastructure needs of seaports, and offer a number of ways to ensure that America’s ports have to ability to continue supporting US international trade. Speaking for AAPA was its president and CEO, Kurt Nagle, who will offer the hemispheric port association’s perspectives about the strong connection between international trade and seaports, and needs to improve freight-handling infrastructure to accommodate the nation’s rising passenger numbers and trade volumes, both now and in the future. In his remarks, Nagle recommended that the best way to provide needed navigation maintenance funding is for Congress to adopt the long-term funding solution AAPA developed earlier this year. AAPA’s solution devotes 100 percent of the funds collected from shippers for the HMT while requiring no additional tax burden on the transportation industry or on taxpayers. This system assures a fair, equitable and reliable way to keep this part of America’s critical transportation system healthy. In terms of increasing investments in landside freight movement infrastructure, particularly road and rail connections with ports, Nagle recommended the Senate adopt the House Appropriations Committee’s provision to mandate that one-third of FY 2019 BUILD/TIGER program grants be allocated to ports. He’ll also ask subcommittee members to support AAPA’s proposal to raise the multimodal caps on FAST Act programs so that multimodal port projects have resources to build connecting projects. With regard to Customs and Border Protection (CBP) staffing shortages amid record increases in passenger and cargo volumes, Nagle suggested that hiring additional CBP officers at America’s seaports, rather than expecting the ports to pay for existing officers’ overtime, is a better solution. He explained that CBP’s Reimbursable Services Program, which allows seaports to enter into agreements to allow CBP to provide, but then charge for, additional services upon the request of stakeholders, is quite costly to ports and sets up an uneven playing field. While the transportation industry already pays user fees to support CBP inspection activities, the additional charges assessed in the Reimbursable Services Program creates competitive disadvantages to US ports. Nagle also expressed concern “about the impact of US tariffs and retaliatory response from our trading partners and the uncertainty they bring.” “To date, the announced Sections 232 and 301 tariffs and the responses from trading partners impact almost nine percent of total US trade value and about 14 percent of containerized trade,” he said.